I made this little sketch yesterday afternoon. It was prompted by a purchase I made on Friday at a local flea market. I found a very old edition of a Nancy Drew book. Nancy Drew and I were great friends when I was young. I remember checking out three Nancy Drew books at a time from our local library. I would read these books over and over until it was time to go back for more! Reading the older versions required me looking up words occasionally. Words like “frock” and “roadster” and “pocketbook” and “veranda” were not in my daily vocabulary!! But I will admit thinking I couldn’t wait to be 18 years old and get my own roadster and asking my dad for money to go buy new frocks!! Be sure to stop by and check out other Sunday Sketches! Visiting from Sunday Sketches site. Oh this is such a cute illustration. 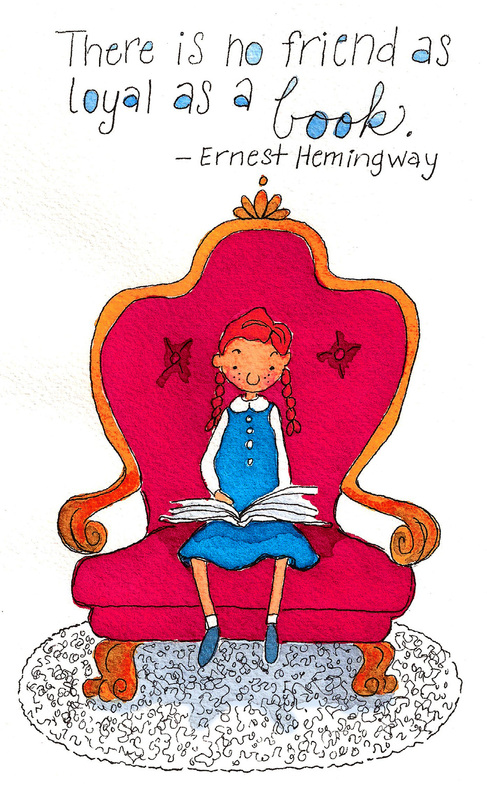 I love the little girl sitting in the big chair and reading a book. It reminds me as well when I was young and didn't do anything but only reading books and dreaming of chairs like your's. Yes, I LOVED reading books when I was younger! I still do now but not as much time as I had then. Sweet sketch, I also liked Nancy Drew! Love your illustration! I was in a Nancy Drew book club when I was a kid and was so excited when they would come in the mail - I still have them in the attic. Unfortunately, nobody seems to want to read them these days. . . I didn't know they had a book club for Nancy Drew! How cool! You're right. No one reads her anymore. Too many other choices, I guess. Hibernating is the best part of winter! I've been reading so much non-fiction lately. The mention of Nancy Drew makes me realize that a little fiction would be fun! Yes...hibernating AND hot chocolate...the best part of winter! I never read Trixie Belden but I had friends who did. Wow, this is so delightful and lovely to sit in your studio when the weather is chilly. Thanks Jennifer. I have heard of the Black Stallion but never read any of those.